Weyerhaeuser plans to exploit a legal loophole and clearcut 250 acres in the Columbia River Gorge National Scenic Area. I’ll get right to the point: This article from Friends of the Columbia Gorge offers a strong overview of this issue, and has links to sign a petition urging Weyerhaeuser to NOT go through with their clearcut. So if you’re in a hurry: Read and Sign! For those who have more time and/or are interested in learning more, I’ll enumerate a more extensive explanation of Weyerhaeuser’s proposed clearcut, and the reasons why this is unacceptable. Weyerhaeuser plans to clearcut approximately 250 acres of forest in the Columbia River Gorge National Scenic Area. The site is southeast of Hood River, and directly south of the Historic Columbia River Highway State Trail, including the beloved Mark Hatfield Trailhead. The photo to the right shows the proposed clearcut areas. This proposed project would be the largest clearcutting endeavor since the establishment of the National Scenic Area in 1986. A good summary of the proposed plan and community concerns can be found in this Hood River News article. Let’s begin by being clear about the definition of clearcutting. That means logging all trees in a swath of land, such that the forest is essentially destroyed and timber yield is maximized. This practice obviously has a significant impact on local ecosystems. It destroys and disrupts wildlife habitat, and contributes to a phenomenon called habitat fragmentation. Habitat fragmentation occurs when large swaths of green space that function as wildlife corridors (areas where wildlife can travel freely) are reduced to small “islands” of untouched land, leaving wide-ranging animals without sufficient space to hunt and roam. The destruction of habitat can lead to increased human-animal encounters, which can be dangerous for all involved. Clearcutting also, obviously, has significant impacts on vegetation – including effects that extend well beyond the initial cut. Clearcuts are prime ground for the spread of invasive plant species, which thrive in disturbed areas with sunny exposure. From the initial logging onward, clearcut areas also suffer soil erosion. The initial logging process churns up the forest floor, and then the lack of tree cover and loss of living roots ensures that the erosion continues unabated from there. This impacts soil health in many ways, including diminished nutrient density. It becomes harder for the forest to reestablish itself, and harder for native species to gain a foothold. More on clearcutting’s role in habitat fragmentation and the spread of invasive species here. Erosion from clearcut forests also significantly impacts stream health, and therefore salmon and steelhead populations. It is well-established that clearcuts not only lead to increased runoff and reduced water clarity in nearby streams, but also that they negatively impact salmon and steelhead spawning. Read more here. Weyerhaeuser is choosing to disrespect the time, effort, and resources that Oregon has dedicated to salmon restoration by choosing to clearcut and damage stream ecosystems. This also is a slap in the face to local tribes, for whom salmon is a significant component of their culture. Finally, timber harvest, generally speaking, is Oregon’s top greenhouse gas-producing industry, and clearcutting is the worst method of timber harvest in terms of climate impacts. Clearcutting emits significant amounts of greenhouse gases, while simultaneously removing significant sources carbon sequestration – namely forests. Read more here. The impacts of climate change are becoming visible, and our region and planet are at a crucial crossroads. For many reasons, Weyerhaeuser’s plan to clearcut in the Gorge is shortsighted, out of touch, and poses a threat to the local and global environment. As discussed in the previous section, clearcutting predisposes the landscape to erosion. This not only means a loss of soil nutrients, but also means that the landscape becomes more prone to significant instability. It is well-established that clearcuts are more prone to landslides than undisturbed or even selectively logged forests. Read more. These risks are most severe when steep slopes are clearcut. As you can see in the image to the right depicting the proposed Weyerhaeuser clearcut area, steep slopes WILL be clearcut. This is ill-advised to say the least, potentially endangering homes and other areas that hold significance for Gorge residents and tourists alike. 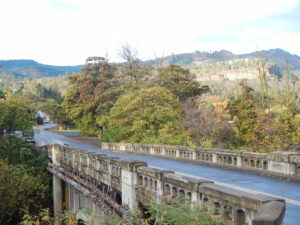 The slopes that Weyerhaeuser intends to log in the Gorge are directly adjacent to key recreation opportunities, chief among them the Columbia River Gorge Historic Highway and the Historic Columbia River Gorge Highway State Trail, including the beloved Mark Hatfield Trailhead and Mosier Twin Tunnels. 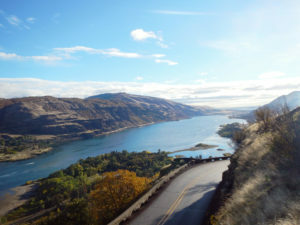 A landslide, therefore, would not only impact local quality of life, but also recreation-driven tourism, a key component of the Columbia River Gorge’s economy, and a key part of the Columbia River Gorge National Scenic Area’s raison d’être. 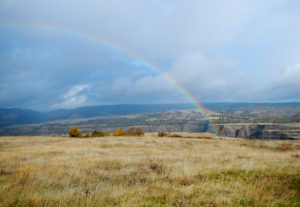 The other component of the Columbia River Gorge National Scenic Area’s raison d’être is its SCENIC VALUE. And its scenic value will be significantly diminished if there are large-scale clearcuts along the Gorge’s famously forested hillsides. Weyerhaeuser’s plan is completely antithetical to the purpose of a National Scenic Area and an insult to the beautiful landscape of the Gorge. 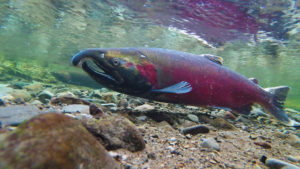 Finally, as discussed previously, the erosion caused by clearcutting also impacts stream health, and therefore salmon and steelhead populations. Fishing for, and consuming, these delicious salmonids is a key component of Pacific Northwest living and tourism, and a crucial part of Native American culture. Risking the health of salmon and steelhead populations by clearcutting hillsides in the Columbia River Gorge is shortsighted and potentially a violation of tribal, state, and federal laws. Weyerhaeuser’s proposed clearcut in the Columbia River Gorge National Scenic Area sets a dangerous legal precedent. 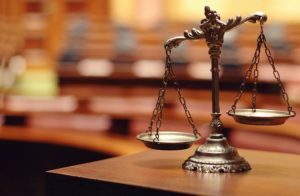 They are exploiting legal loopholes that could become wider as a result of their ill-advised behavior. 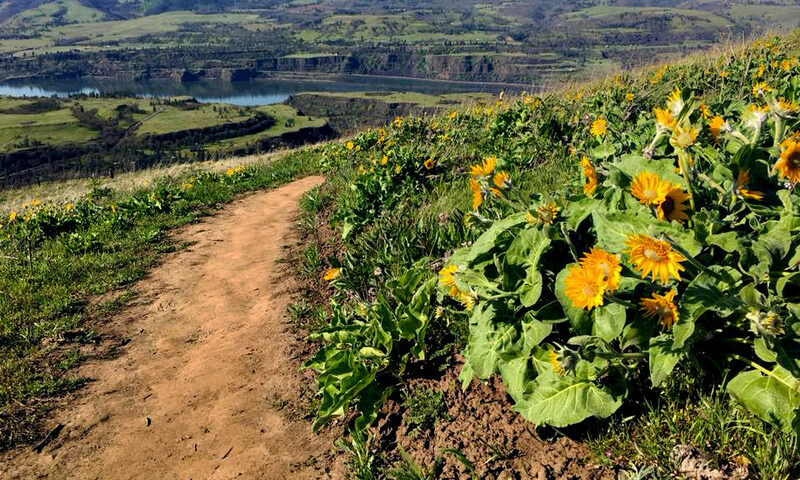 Although the National Scenic Area designation promotes the preservation of the Columbia River Gorge’s scenic splendor (the word “scenic” is in the name, after all), the legislation also allows for diverse land uses in the Gorge, from recreation to agriculture. Logging is not explicitly prohibited, though there are non-binding guidelines for doing so in a way that is sustainable and does not harm the Gorge’s scenic value. Furthermore, it is my understanding that sustainable forestry practices are only required in Special Management Areas (SMA) of the National Scenic Area, rather than throughout the Columbia River Gorge National Scenic Area – thus Weyerhaeuser can technically log this area legally. Weyerhaeuser is exploiting these loopholes. What they are proposing to do may not be illegal, but it is certainly against the spirit of the law that created the Columbia River Gorge National Scenic Area. Furthermore, Weyehaeuser is deliberately avoiding a key component of environmental policy best practices: Facilitating stakeholder discussions of any significant project that will have an impact on a community. Weyerhaeuser has not even had the courage to face any representatives from the towns that this proposed clearcut will effect – specifically Hood River and Mosier. 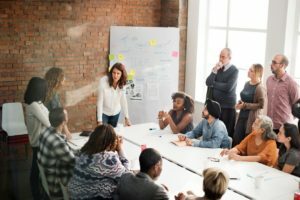 So it will perhaps come as no surprise that they also have elected to avoid hosting public information sessions or community forums. Weyerhaeuser is instead proceeding without public input, in a project that has potentially significant ramifications for Hood River and Mosier. This non-collaborative approach goes against the spirit of modern environmental decision-making and sets a dangerous precedent for corporations to override the will of local communities that will bear the brunt of the impacts of their projects. Weyerhaeuser’s flouting of environmental policy best practices demonstrates a lack of concern for collaborative decision-making, as well as a lack of concern for the impacts that their clearcut will have on local communities. By not soliciting community input and attempting to slip this project under the radar, Weyerhaeuser blatantly shows that they don’t care what local communities need or want. Indeed, it seems as though Weyerhaeuser is only concerned about their own bottom line. The impacts of clearcutting on various ecosystems is not news: This is well-established scientific knowledge that anyone in the Pacific Northwest should be aware of. A northwest-based logging company like Weyerhaeuser cannot possibly be unaware of these risks. Thus we must assume that they simply don’t CARE about the ecological impacts of their proposed project. Again, Weyehaeuser seems only concerned about their own financial gain. Finally, the Columbia River Gorge National Scenic Area has had a hell of a year. With a still-smoldering fire that decimated an estimated 48,861 acres in September 2017, the Gorge is only just beginning to recover from a significant environmental and economic disaster. To propose to clearcut some of the Gorge’s remaining forest on the heels of the Eagle Creek Fire is tasteless and insensitive. If Weyerhaeuser had any sense of decency, they would be helping with the Eagle Creek Fire recovery efforts, rather than proposing to destroy one of the few areas of the Columbia River Gorge National Scenic Area that was spared from the flames. First of all, I encourage you to read this article and sign the petition it links to. Thirdly, I highly recommend becoming a member of Friends of the Columbia Gorge. Your donations help to power this nonprofit’s multilayered work for the protection of our beloved Gorge, and being on their email list will keep you abreast of new developments in this fight against Weyerhaeuser, as well as other topics ranging from Eagle Creek Fire trail recovery projects to group hikes. And finally, let’s spread the word. The news only broke yesterday (May 29), so we need to begin mounting our defense. The bigger the outcry, the harder it will be for Weyerhaeuser to see their project through. Share this article, share the petition, and make a statement: YOU DO NOT MESS WITH OUR GORGE! Thank you for your passion and activism.